We are so pleased to extend this popular environmental program in communities that are now part of the Dominion Energy family. RICHMOND, Va., Jan. 7, 2019 /PRNewswire/ -- Project Plant It! – the free environmental education program created by Dominion Energy to teach kids about the important role of trees in the ecosystem – has been expanded to 18 states, including the Carolinas. Online enrollment for the program is now being offered in regions of North and South Carolina previously served by SCANA gas and electric companies. Dominion Energy and SCANA merged in early January. "Arbor Day 2019 will mark the thirteenth year for Project Plant It! and we are so pleased to extend this popular environmental program in communities that are now part of the Dominion Energy family," said Hunter A. Applewhite, president of the Dominion Energy Charitable Foundation. "So far, thousands of children have been able to learn about and celebrate trees by planting seedlings received from Project Plant It!." This year, Project Plant It! will ship 75,000 tree seedlings free-of-charge to participants in time for Arbor Day plantings on April 26. The program is open to groups serving children and teens of all ages and grade levels. 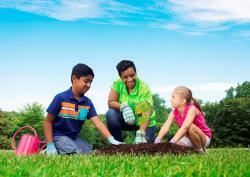 Schools, scout troops, civic and church groups, environment clubs and other entities that work with youth are eligible to request tree seedlings at http://www.projectplantit.com/. The deadline to register is Feb. 15, 2019, or while supplies last. A newly-refreshed website, at http://www.projectplantit.com/, offers an easy sign-up procedure for tree seedlings and highlights the educator resources and lesson plans that can be downloaded for free. Three new educational games are featured on the website for grades K-4, 5-8, and 9-12. These games are perfect for rainy day fun when kids can't play outside. The website also includes a number of instructional tools, including an Educator's Guide with 12 lesson plans that support third-grade learning standards for math, science, language arts and social studies. Fast Facts about Project Plant It! Nearly 7.5 million customers in 18 states energize their homes and businesses with electricity or natural gas from Dominion Energy (NYSE: D). Through its Dominion Energy Charitable Foundation, as well as EnergyShare and other programs, Dominion Energy contributed more than $30 million in 2018 to community causes throughout its footprint and beyond. The Foundation supports nonprofit causes that meet basic human needs, protect the environment, promote education and encourage community vitality. Please visit www.DominionEnergy.com to learn more.